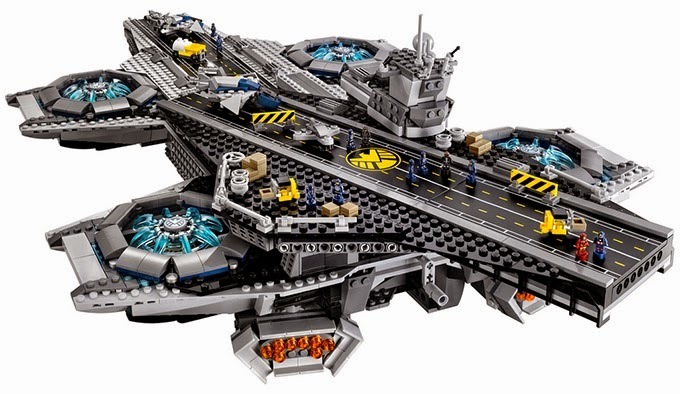 LEGO HAS LINKED UP with Marvel Comics to create a brick-version of the huge SHIELD Helicarrier from The Avengers movies. SMN report: According to Lego, "Take on the challenge of building this awesome Lego model of The SHIELD Helicarrier. Construct the flying aircraft carrier with 2 runways, microscale Quinjets, fighter jets and ground support vehicles. "The set also comes with many of your favorite Lego Marvel Super Heroes minifigures, plus 12 microfigures to display on deck and within the highly detailed interior. Includes five minifigures: Nick Fury, Black Widow, Captain America, Hawkeye and Maria Hill." The model will keep all and sundry quiet for more than a few minutes, as there are no less than 2996 separate pieces. Suitable for anyone over 16, says Lego. The Lego version of the Marvel SHIELD Helicarrier is not cheap, so you need to be a fan rather than a casual purchaser. That said, it looks pretty good to us, and a suitable way to spend a winter weekend out of the cold. Prices are US $349.99-$399.99, Germany 349.99€, UK £269.99, Denmark 2999.00 DKK. Head on down to the Lego shop for more details.